Everybody knows that we need to sanitise water to destroy bacteria. But at what cost to our families health and our fragile environment? 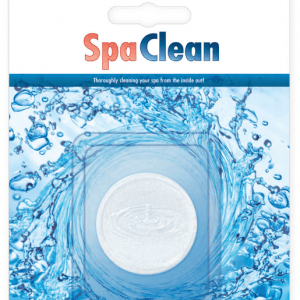 The use of traditional chemicals such as chlorine or bromine in your spa result in strong smelling water. Also causing harsh unwanted side effects on your skin, eyes, chest and even your spa’s equipment. Alsothe headache of having to do the time consuming multiple daily measurements and adjustments. Even after all of this…………. Maybe not! But to understand why, you firstly need to know about the real cause of bacterial build up. It’s a industry secret about a foul, slimy substance that lurks unseen on surfaces and in the pipe work and of your spa called Biofilm! For years scientists have understood that to thrive, bacteria create a layer of slime in which they shelter, feed and breed. Over time this slime increases in thickness, creating serious additional problems. For example high levels of chlorine or bromine can only kill bacteria in the outer layer of an established Biofilm. Meanwhile leaving the unharmed bacteria below to continue breeding. Did you know that 99% of all bacteria live in the Biofilm. Only 1% actually live in the water itself. Moreover it is only these so called ‘free floating’ bacteria that we are able to kill with traditional sanitiser’s such as chlorine or bromine!! In one simple weekly treatment our patented environmentally friendly formula gets to the root of the problem. By loosening this layer of slime from the surfaces. Subsequently it is then rinsed away by the action of the water and prevented from reforming. Hence the result, a dramatic reduction in the levels of bacteria. Therefore only the minimal amount of sanitiser is required! Even calcium, the notorious destroyer of spas, is not match against the power of AquaFinesse. The perfect all in one solution, safe, clean, crystal clear water which protects the bathers, the environment and even the spa itself. Finally say yes to softer purer water and a cleaner bathing environment SAY YES TO AQUAFINESSE. 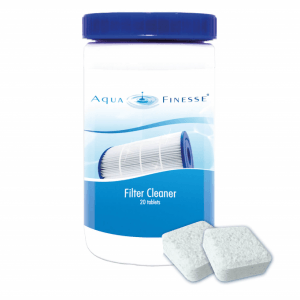 Aquafinesse is a completely different spa maintenance alternative to chlorine or bromine. We provide clean, clear and odour-free water with only one dose per week. AquaFinesse also softens hot tub water by eliminating calcium and scale build-up from the tub’s equipment. Our product not only makes your life easier. Aso extends the lifetime of your hot tub up to three times longer than with the use of traditional sanitisers! When used in combination with a good working ozone or silver ion system, no additional sanitisers are needed. However, the National Spa and Pool Institute (NSPI) recommends that hot tub owners maintain a minimum level of 1.5-ppm chlorine in the spa water. Therefore to meet these standards, we strongly suggest using the provided sanitising tablets as directed in the slow-release dispenser. Soon, your water will be in the best shape of its life-no pH products, clarifiers or additional chemicals needed! Aquafinesse – Tried and tested. Aquafinesse has been dermatologically tested. Using Aquafinesse will make your skin feel soft and smooth. Aquafinesse meets the world’s most stringent restrictions in respect to water bacteriology. The world renowned institution TNO designed and set the hygiene and safety standards for use in the EU. And these are formally used in Germany and The Netherlands to name a few. These safety standards are the benchmark which Aquafinesse met and was tested by the equally renowned international testing agency KEMA . Kema is involved in water safety and usability all over the world. Difficulty in balancing the pH level of the water – testing kits are complicated and you easily add too much chemical adjusting the balance, creating further problems. Improper water balance can seriously damage your hottub’s operating equipment (heaters, pumps etc). ….and your health – irritation of eyes, airways and of skin. Lime scale can build-up on the working parts shortens the life of the equipment drastically. Chlorine kills bacteria in the water, but in the process also kills the good bacteria in the water. Likewise in the process also kills the good bacteria on your skin. Thus leaving your skin feeling dehydrated and fragile after using the hot tub. Chlorine smells are unpleasant – even after a shower most users can still smell the chlorine on their skin. Consistent concerns about the quality of water and its effect on the health of your family. Have you noticed how the walls of the hot tub sometimes feel slimy? This slime is called a “Biofilm,” and that is exactly where the bacteria are having a celebration! This is how “Biofilm” develops: Bacteria need peace and quiet to grow. Therefore, they will settle in the quietest place possible in your hot tub, which is in the “skin” of the water (Did you learn in school about how water has a “skin”? *look across to find out more). The “skin” is the surface layer of the water, the area that sits against the interior walls of the hot tub and inside the piping. Once settled the bacteria will create the perfect environment for themselves by producing protective slime or “Biofilm”. And no amount of filtration will move the bacteria laden “Biofilm” at this point. For decades, spa water treatment systems incorporated harsh chemicals that can take away from the enjoyment of owning a hot tub. Unfortunately, most hot tub owners have become accustomed to the unpleasant smell and harsh effects associated with these chemicals. Instead of a relaxing hot tub experience, many people leave their spa with red watery eyes. Also irritated skin, discoloured swimsuits and the lingering odour of various sanitising products. And the time spent balancing your hot tub water can take away almost an entire week’s worth of free time each year*! 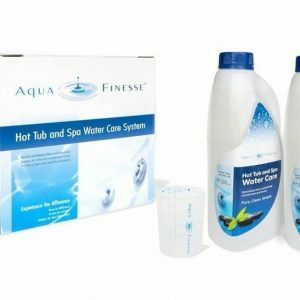 Unlike traditional hot tub water care products, AquaFinesse softens your spa water and soothes your skin without the harsh effects of chemicals. It completely reconditions the water and equipment to eliminate the threat of contamination. As a result, there’s less “killing” to do. Consequently this means significantly less chemicals in your water and less time spent on spa maintenance. With AquaFinesse, soaking in your spa becomes a special experience for you. As well as your family and friends. Simply add AquaFinesse to your water once a week and that’s it! Just one dose per week sanitises and balances your water while eliminating greasy water lines, slimy surfaces, foaming, calcium and scale build-up. You’ll really appreciate having more time to relax and enjoy your hot tub in a safe, soft and crystal clear water environment. Forget what you know about hot tub water care. Welcome to AquaFinesse and the best hot tub experience of your life. Drain hot tub completely. Run garden hose for 60 seconds before filling the tub with fresh tap water. Shake the bottle of AquaFinesse to mix the solution. Pour the correct amount of AquaFinesse (as indicated on the bottle) into the water. Do NOT overdose. Turn on jets for a minimum of 2 minutes to activate the AquaFinesse water care system. Place one sanitizing tablet in the slow-release dispenser, close cap, fill with water and place on top of filter (or basket). Check dispenser every week to make sure tablets are still intact. For tubs with functioning ozone or silver ion systems, the use of sanitizing tablets may not be required. Repeat steps 2-4 on a set day every week.